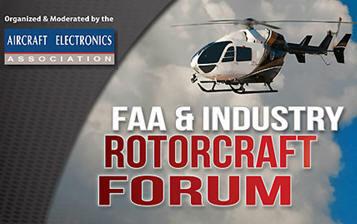 February 6, 2012 - On Thursday, more than 70 general aviation industry leaders and regulatory executives concluded a successful two and half days avionics rotorcraft forum at the Aircraft Electronics Association International Headquarters (AEA). Participants discussed the challenges and opportunities in the certification and installation of new avionics technologies in the rotorcraft market, and the forum opened the lines of communications between industry and the Federal Aviation Administration's Rotorcraft Directorate. Organized and moderated by the AEA, the event occurred Jan. 31-Feb. 2 at the AEA's Dan Derby Center for Professional Development in Lee's Summit, Mo., a suburb of Kansas City, Mo. "We had a highly successful opening meeting, which created free dialog between the Rotorcraft Directorate and industry," said Ric Peri, the forum's moderator and AEA vice president of government and industry affairs. "Each participant walked away with a better understanding and appreciation of each other's challenges in satisfying customer needs and promoting aviation safety." The group agreed to schedule a follow-up avionics rotorcraft forum, which is set for Aug. 21-23 at the AEA's international headquarters. "The AEA has long worked with the FAA and other international regulatory agencies to promote the installation of new safety-enhancing avionics technologies in aircraft," said Paula Derks, AEA president. "This forum is the next step in a long-running dialog with the Rotorcraft Directorate." FAA leadership in attendance at the forum included, Rotorcraft Directorate, Small Airplane Directorate, Aircraft Certification Division, Flight Standards Division. Industry participants in attendance included Rotorcraft OEMs, Avionics OEMs for rotorcraft applications and MROs in the rotorcraft market. The forum occurred with the cooperation and assistance from the General Aviation Manufacturers Association and the Aeronautical Repair Station Association. Founded in 1957, the Aircraft Electronics Association represents more than 1,300 repair stations from throughout the world specializing in maintenance, repair and installation of avionics and electronic systems in general aviation aircraft. The AEA membership also includes manufacturers of avionics equipment, instrument repair facilities, instrument manufacturers, airframe manufacturers, test equipment manufacturers, major distributors, engineers and educational institutions.